Greenspun Media sponsors this collection. Greenspun Media retains possession of the bound, original newspapers. 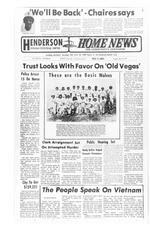 Henderson District Public Libraries retains possession of the microfilm and the digital files.